glitter and over the top projects that celebrate good times with family and friends. My mum puts a lot of effort into choosing a colour palate to decorate her home. Each year you can see the thought put into her table and wall display and they always look amazing. So where does it all go when the festive season is over? Into old cardboard boxes and plastic bags. So my project I would like to show you this week is a bucket with a lid I have decorated with the beautiful papers from Megs garden to store it in. I choose a paper that I could glue onto the bucket and then fussy cut out the same Christmas baubles to match. Using foam tap I attached them so this gave a 3D look to the picture. Like I said Christmas to me is glitter. So glitter glue was used on everything. I hope you like my project. You could cover old shoe boxes , storage bags or even what your Christmas items are stored in now to jazz things up. Twinkling Christmas cards i hope you enjoy these cards as much as i did making them. Its never too early to start our Christmas cards. 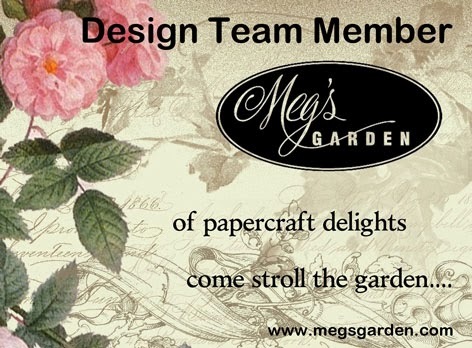 Don't forget to stop and see what the another talented Design Team ladies have created. Use 1 of the A4 'A Twinkling Christmas' papers & create a full page art piece.They can be hung using ribbon attached to the top on a door or wall; displayed on a mantle piece or wherever you want a small piece of A Twinkling Christmas. This is also an A4 paper double mounted on white with green. A TWINKLING CHRISTMAS - WITH SLIDER CARD AND FRIENDS. This month I have been fortunate to receive the new Christmas range from Meg's Garden called 'A Twinkling Christmas'. I have used the Card Pack which contains 2 x 6 gorgeous papers, along with the Ephemera sheets. These are so divine as you will see. Firstly, I created a 'slider' card, which I thought would be a little different for Christmas. I love making this card as it involves a little sewing. I then embossed some snow around the bauble for a little extra effect when the card opens. and this is the card when it is fully open. My next card was using the Ephemera sheeet. I simply adore these images. and embellished with Meg's Garden lace trim and metal emb. Finally, for my next card I fussy cut the snowflake and embossed and sprinkled with a little glitter. added a little of the Meg's silver trim and doily and here is the finished result. Hello sweet visitors and welcome to the Garden. So nice of you to drop by. So, this is part two of my 'Two Simple Journals' posts. If you would like to take a look at Part#1, HERE is the link. These are the two books I created using Megs Garden's lovely papers. In this post I will share with you the booklet on the right .. my writer's Journal. This is the little book I will use to practice my hand writing. As I said in Part#1, I used to have a reasonably neat hand but, over the years, that has deteriorated quite badly so now I need to practice to get it back up to scratch. The inspiration for this booklet came from Astrid Maclean of Astrid's Artistic Efforts. Astrid, like me, loves to make all kinds of booklets and, lately, she has been working with the Eileen Hull die. Unfortunately, I don't have that die so I had to make mine by hand but I did use that book as inspiration for my design. The papers used for this Journal are all from the A4, digital version of the 'In the Watercolour Garden' Collection. As I wanted a reasonably soft cover, I simply made it from cardstock. I used black for the outside cover and kraft for the inside. The finished book, when closed, measures 4.75" x 8.5". I glued a piece of chipboard behind the spine on the inside cover for extra strength, punched the holes, threaded the elastic through those holes and simply knotted it at the back. I then glued the two covers together. As with the first Journal, this one doesn't have much in the way of embellishment. As this is also a work book, I didn't want anything three dimensional getting in the way. Besides, these papers have such lovely graphics on them that I really didn't want to cover them up. For the front cover though, I did add a Tim Holz door knob and some stamping. I also fussy cut a second butterfly to give it a little bit of dimension. I really love the graphic on this paper .. simply stunning!! The inside cover and the first signature. I added a pocket on the inside front cover and added some faux stitching with a gel pen at the top. The 'lace' is simply a strip cut from the edge of a paper doily. The pocket will house a small booklet which will mainly be used for any hints and notes that I may find and wish to keep. I added more faux stitching around the edge of the paper. There are three signatures in this booklet .. I cut some pages from a cheap exercise book for the inside, made a cover for each signature and stapled them together. Each one loops under an elastic band in the spine of the outer cover. This way, as I fill them up, I can create new signatures and replace them. Added a strip of washi tape at the edge of the signature to give the spine a bit more strength. The only other bit I did was to add the quote. As I said before, these papers have the most gorgeous graphics they really don't need any enhancement. Back of the first signature and front of the second. Love this music paper .. so gorgeous!! All I did here was to add the quote. Back of the second signature and front of the third. I simply had to use this paper again .. I love it so .. and I only added the quote. After taking this photo, I did add that strip of washi tape to the spine though, for added strength and continuity. Back of the third signature and inside back cover. This is the most gorgeous background paper .. I didn't add anything because I didn't want to spoil it. Love it just as is. As on the inside front cover, I just added some stenciling with Distress Ink. A little metal embellishment on the back ..
My work book is complete!! I hope you like my little book and I'm sure you will agree with me that those papers are simply stunning!!!! If you'd care to take a look at all of the gorgeous papers available in the Garden HERE is the link. While you're there, why not take a look at all the fabulous products in store .. I know you will find something that you cannot bear to be without!! LOL!! Why not also take a further stroll through the Garden. There is some wonderful inspiration to be had from the fabulous creations by my Teamies. Thank you so much for dropping by today and, whatever you have planned .. do it well, do it safe and enjoy your day! !